When Anjum joined an engineering college for a degree in economics, she didn’t know what exactly to expect from her next 5 years. Based in the rural town of Pilani in Rajasthan, India, she was introduced to social sector early on with her engagement with the student organization, Nirmaan. While working on diverse grassroots projects in education, employment, financial inclusion, and community engagement, she came face to face with deeper questions on the idea of development and the role she should play in it. That kept her drive alive in order to cycle to and fro, in her free hours, between college campus and aanagnwadi and training centres in villages. Later on, as a president of pilani chapter, she managed strategy, organizational partnerships and fundraising efforts for the organization. She was awarded the Mantra Award for Social Leadership by BITS Alumni Association for these efforts in Pilani. Her interest in exploring the social sector took her to diverse organizations such as ASER Centre, SRISTI, and Institute of economic growth where she worked on monitoring and evaluation, research and policy design respectively. Since last 4 years, she has been working with Goldman Sachs at the intersection of technology, data and business and learning skills like analytics, project planning and people management. With support from Amani, she is eager to re-enter the development sector and continue her changemaking journey. In her spare time, she loves to read, be outdoors and engage in experiential journeys. 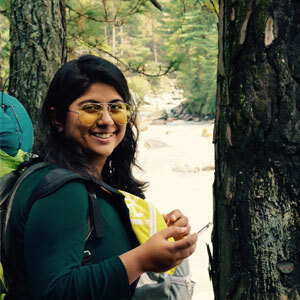 In her quest for unique experiences, she took part in a 100 Kms trailwalk that she used as a platform to raise funds for Oxfam India.